The Aero A.18 was a biplane fighter aircraft built in Czechoslovakia in the 1920s. It was a development of the Ae 02 and Ae 04 fighters Aero had designed during World War I, but also borrowed from the more recent A.11 reconnaissance-bomber design. The aircraft was designed by Antonin Vlasx�k and Antonin Husnik and first flew in March 1923. It was only one of three prototype fighters that Aero flew that year, but this one was selected for production over the A.19 and A.20 that competed with it. Twenty machines saw service with the Czech air force in the period between the wars. 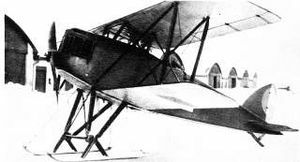 The A.18B and A.18C were specially modified racing variants that competed in the Czech Aero Club's first two annual air races, in 1923 and 1924 respectively. Both aircraft won their races, and the A.18C is preserved at the Letecke Muzeum in Kbely along with a replica of a standard A.18 fighter.